Franklin Mills Cantilever Shelving offers a growing facility the ability to develop stack systems to adhere to any volume size assortment while maintaining the systems integrity. Our cantilever shelving is a solid reference for experts in library design. Our cantilever shelving system offers a wide range of accessories and practical features. Sections can be reconfigured, lengthened, shortened, relocated, or joined to existing units easily and without adding any extra parts. Franklin Mills offers products that adapt to all types of media. Cantilever shelving eliminates the front posts associated with conventional shelving. Heavy-duty frames support the adjustable shelving from the back instead of the sides creating a clear unobstructed view of the media. Shelves can be slotted or plain, straight or sloped, and do not have the view obstructing uprights needed in other systems. Franklin Mills cantilever shelving creates three times more filing inches per square foot than conventional filing equipment, keeping books clearly visible and close at hand, greatly reducing retrieval time. Maximum filing inches - Uses space that other filing equipment can't use. Modular construction - Individual units, no starters or adders. Maximum visibility - No time consuming drawers to open and close. Easy Access to books - Flexibility for optimum storing books and various media. There are many accessories and special type shelves that fit onto the cantilever center frame. Special shelves for periodicals, paperback books, audio tapes, CD�s, audio books and DVD collections can all be added to supplement standard book shelving. Plus special display racks and various way to store newspapers. At some point you may need to reconfigure-that's where Franklin Mills cantilever library shelving systems really pay off. Every shelf, frame and accessory is made to the strictest standards to ensure simple reassembly, and since our shelving is designed for static and mobile configurations, you can achieve maximum capacity no matter how you arrange your library. Robotically fixtured and welded upright, heavy-gauge frames ensure the most consistent frame in the industry. Upright base supports interlock with upright shear tabs for maximum structural integrity. Shelf end brackets hook into the upright. They are smooth and clean with rounded edges to protect books. Metal, wood or laminate end panels fasten to the upright. A complete line of display options and accessories available. Roll form automation provides the most exact and consistent tolerances in the industry. Environmentally safe powder coat paint finishes. Franklin Mills continues to pioneer the storage industry. Libraries around the world rely on us for consistent quality and superior construction, shelf after shelf, frame after frame. Whether school, academic, special, or public, we have the experience to respond creatively and comprehensively to your library's needs. Click here to view our brochure on Montel Aetnastak cantilever library shelving. 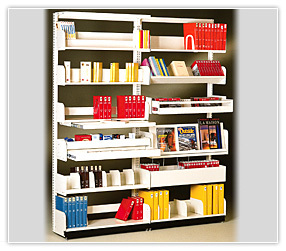 Contact the experts at Franklin Mills to discuss cantilever shelving for your library at 1-888-678-4585.